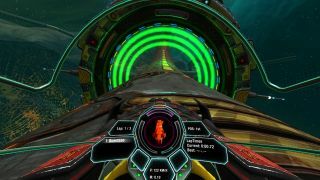 The high-speed VR racer Radial-G: Racing Revolved hit Steam Early Access today, and I think it's fair to say that a lot has changed since our early hands-on in July. The Early Access release includes one world with three tracks, three selectable ships, single-player and 16-player online multiplayer modes, and support for the Oculus Rift DK1 and DK2. Radial-G took a run at Kickstarter over the summer but actually failed to meet its goal. The Tammeka Games development team sees Early Access as an alternative way for fans to support the game's development. "We will pump all the funds generated from Early Access sales straight back into development to bring more content and additional features forward and available sooner, whilst adding the final polish needed for full release," it said in the Early Access announcement. A full release date hasn't been announced but the Early Access period is expected to take no more than three months. The full version will include more tracks and environments, additional track features, and fully-implemented audio rather than the current placeholder music and effects. Multiplayer support will be increased to 32 players, and the developers plan to add additional game modes for both single and multiplayer post-launch. The Early Access edition of Radial-G goes for $13, while the full version will go for a higher but as-yet-unannounced price. There's also a free, single-player-only demo available at radial-g.com.